The last IBM Global CEO Study ('The Enterprise Of The Future') interviewed 1,130 CEO's in 45 countries and 32 industries. It found that organisations felt bombarded by change, and that many are struggling to keep up. Eight out of ten CEOs saw significant change ahead, and yet the gap between the expected level of change and the ability to manage it had almost tripled since the previous study in 2006. An inability to cope with the pace of change. That's pretty serious. We live in exponential times. A time of accelerating change. A time when disruption is everywhere. When transformational technologies are increasingly embedded in cultural norms. A competitive landscape where your next major competitor won't be the lumbering corporate that you market-share against, but a small, agile start-up that you've never heard of. Where a single network that now connects 400 million people worldwide, didn't exist as an open platform four years ago. Where another that is less than three years old celebrates its 10 billionth piece of communication. In order to be successful, said the IBM report, the enterprise of the future will be hungry for change, innovative "beyond customer imagination", disruptive by nature. Forgive my cynicism, but I find it hard to believe that most global conglomerates have the culture to continually disrupt, or even the necessary working practices to be that adaptive. Take budgets. Budget setting in most organisations is a dilatory, laborious, top-down, bottom-up process that likely takes up to 3 months to complete. By the time it's made it all the way to the top to be authorised it's 3 months out of date and largely irrelevant. Budgets do two things within organisations - they become an objective and a measure of performance. So if your budget is no longer relevant, your key objective and your measures of success are already flawed. And yet, with the current economic malaise, there has never been more reason to become more adaptive or a better time for re-invention. The fact is that with 15 years of continuous growth, many senior managers have little or no experience of working in a recession. A study by Professor Eddie Obeng (of the Henley Business School and the Design Council) in 2008 found that over 70% of senior management have very little experience of coping with such conditions. At the time of the last recession, in the early 90's, Obeng was arguing that: "We have moved as a world, from an age when we could learn faster than our local environments change to one where the local environment of individuals, organisations and governments changes faster than we can learn." As a result of this shift, he says, most of the concepts, best practices and assumptions commonly used to plan, manage, and lead us are obsolete. So you have to learn as you go, from other people, and look for patterns rather than events. "Our structures need to be more speedy. Speed used to kill now lack of speed kills. Lets have organizations that can iterate quickly and empower its folks to make decisions. Percolating decisions up and down an organization makes little sense"
For many brands, Adaptive Marketing shifts the emphasis away from grand, polished, flawless launches, to a continuous and diverse stream of optimised messaging and content. For agencies and client companies alike, this is a long way from inflexible annual (or longer) planning cycles. And many of those companies are a long way from having the business practices necessary to deal with the degree of responsiveness this requires. "For nearly all of history the success of a society was proportionate to its ability to assemble large and disciplined organizations. Those who bet on economies of scale generally won, which meant the largest organizations were the most successful ones. But in the late twentieth century something changed. It turned out that economies of scale were not the only force at work. Particularly in technology, the increase in speed one could get from smaller groups started to trump the advantages of size." I think the learnings from the software industry are very instructive. It's an industry that taught other industries about the value of openess and collaboration - of learning from other people. 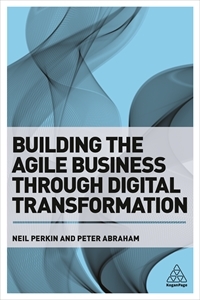 But there is another, perhaps more fundamental lesson that analogue business needs to learn from digital business practice - agility. It's a philosophy that is embodied in the agile development movement and one that (as I've written before) is centred around some enlightened principles that many industries, not least advertising, would do well to note. Agile is already an overused word. As Tim says, it is often seen as some kind of panacea. But Stuart is right in saying that it is not about process. Nor is it about productivity gain. Agile is absolutely about a philosophy. If you don't get that, you'll never be agile. As The Agile Manifesto sets out, it is a philosophy that values individuals and interactions over processes and tools, working software (aka outcome) over comprehensive documentation, customer collaboration over contract negotiation, and responding to change over following a plan. It's not that there isn't value in the latter, just that the former has more value. There are some big differences between the principles that shape this philosophy (I recommend you read them), and the practices that typically characterise big business. Traditional business models set objectives which once set, rarely change, and struggle to cope with priorities that alter once the process has begun. Agile welcomes changing requirements, even late in development, because it is an opportunity to harness change for competitive advantage. Big business creates big projects that take a long time to confirm, implement, and complete. Projects are often stalled by hierarchical management processes. Agile is focused on frequent deliverables, with a preference for shippable product and shorter cycles, and implemented at a constant pace which is measured and transparent. It is centred around the belief that the best results come from self-organising teams. Teams that reflect regularly on how to become more effective, then adjust behaviours accordingly. Projects are built around trusted, motivated individuals who are given the environment and support they need. Documentation is kept to a minimum, with face-to-face communication preferred, and a focus on simplicity - maximising the amount of work not done. I don't claim here that agile development processes are some kind of cure-all. But I do think that business processes in many industries and organisations are woefully out-of-date and hopelessly rigid. Businesses increasingly operate in complex adaptive systems which, as Bud Caddell rightly says, are "characterized by perpetual novelty – talking of equilibrium is pointless, equilibrium in a complex adaptive system is essentially a dead system". Inflexible, long-term strategic plans are increasingly irrelevant. Many of the really interesting business models in the new economy use radically different ways of working. Smart businesses increasingly enjoy the flexibility of using the growing number of skilled, talented, experienced individuals who consult, freelance, design, build, develop, project-manage. A model that puts them in the middle of a talent network, without the overhead. Other businesses are turning traditional models on their head by putting themselves at the centre of communities of skilled contributors and advocates formerly known as customers, enabling development cycles that are many times quicker and processes that are many times less capital intensive than industry norms. End-user expectations are shifting (have shifted?) rapidly to real-time everything. Culture is participative. Content producers curate as well as create. Business no longer has the luxury of responding in its own time on its own terms. It is a minimum requirement to be not only responsive but inclusive. Companies are developing entirely new relationships with both their workers and their customers. Customer service is moving out of its silo. Rigid, lengthy planning cycles may suit the company, but they don't suit the customer. Marketing is adaptive. Relevance determined in the moment. How many reasons do you need? Change and innovation in organisations happens in the "very murk and muck" of everyday actions by the people in that organisation, not through a CEO strategy presentation. The real challenge for corporates is changing the very habits and processes on which they are built. Paul Graham speculates that startups might just represent a new economic phase, on the scale of the Industrial Revolution. Maybe. But unless change like that happens, many big businesses won't be around long enough to find out.